Image Size: 33 X 21.5 in. This band of travelers, seemingly at peace with themselves and confident of their final destination, seems to hold no secrets. And yet, the lioness looks back to see if they are being followed and the bird messenger leans over, uncertain of the way forward. In this image, the viewer joins the journey and does not know the final outcome. Often it is the unfinished story that is more exciting than the story that divulges every detail. This traveling circus represents a snapshot in time. 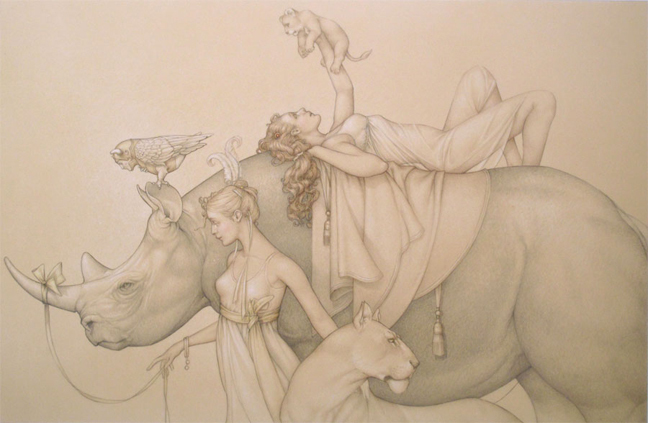 The lioness looks to the past and the bird messenger and rhinoceros look to the future, leaving their human companions to enjoy the present moment.